Similar in feel to Cherry MX Blacks, Gateron is Cherry Clone with a feel that more than holds its own with Cherry. No feedback, but a nice silent switch. Spacebar feels great though, or typing would be HORRIBLE. Overall, it's pretty good! 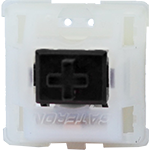 Have experience using Gateron Black switches? Add a review to share your knowledge with the keyboard community.